It turns out, I kinda try on a lot of clothes every month, so it's already time for some more fitting room (and bedroom) snaps! 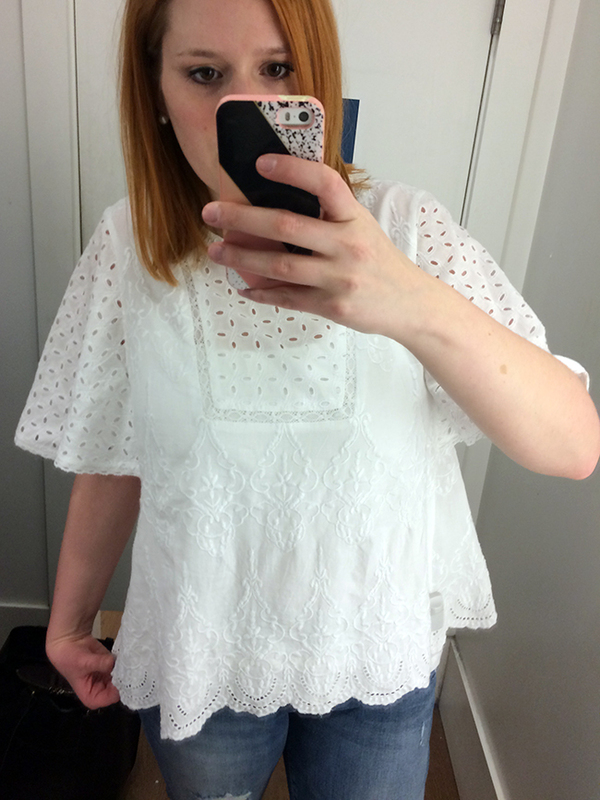 This eyelet top is super adorable, and I freaking love the embroidery detail. It was just a little too blousy on me - would look great on someone with a smaller chest though! Wearing an XL here. I don't think I've tried girlfriend jeans, but they may be my new favorites! 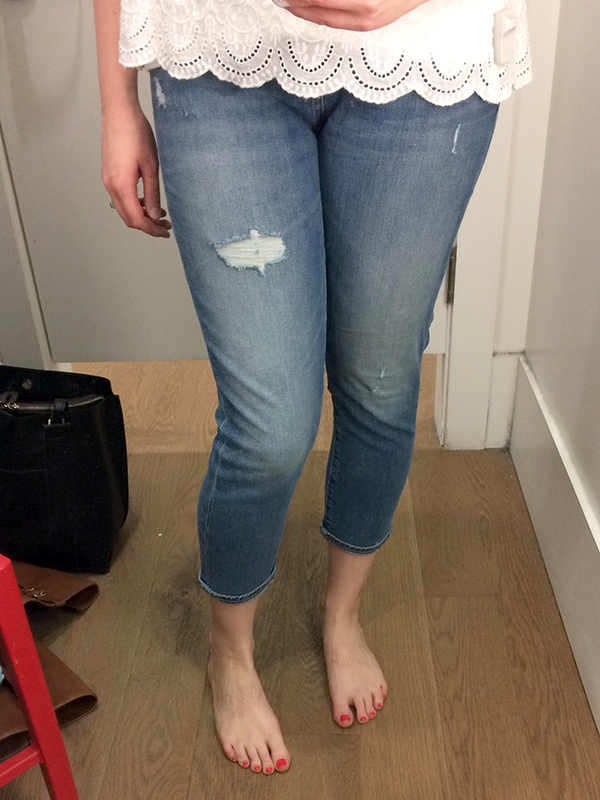 The fit is closer to a skinny jean than boyfriend, but in a looser, more relaxed way. There also isn't much stretch in this pair which was flattering. I didn't bring these home though because they didn't carry tall lengths in store, and they were way too cropped on me. I couldn't find the exact wash online, but this one is close. Wearing a size up from my regular here because of the lack of stretch. 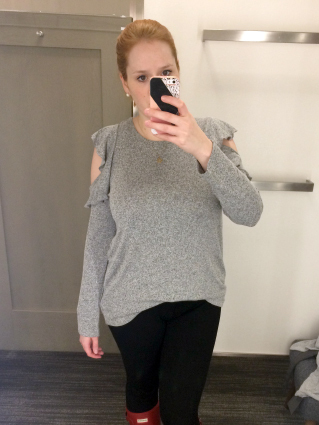 I added this short sleeve sweater to my wishlist last week, and was excited to find it in stores over the weekend. 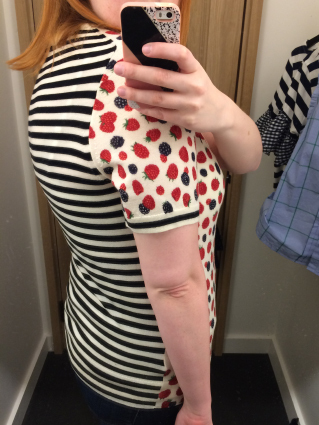 I freaking love the berry/stripes pattern combo and think it's super adorable, but it wasn't on sale and I couldn't figure out when I would ever wear a short sleeved sweater and be comfortable, so I left it behind. Maybe if a sale shows up I would reconsider - wouldn't it look so cute with a black circle skirt or a longer denim skirt?! Wearing an XL here. I saw this top on the clearance rack and thought I'd give it a try. 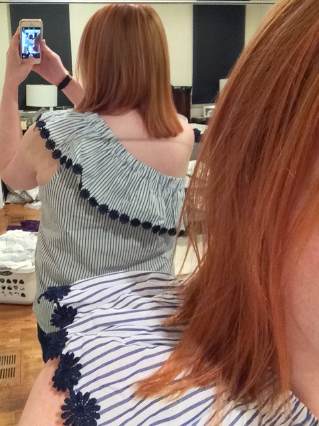 I don't know when I'm going to learn that high ruffled necklines don't work on me, but it hasn't happened yet. Wearing a 14 here. When I initially saw this top online, it was a hard pass for me. 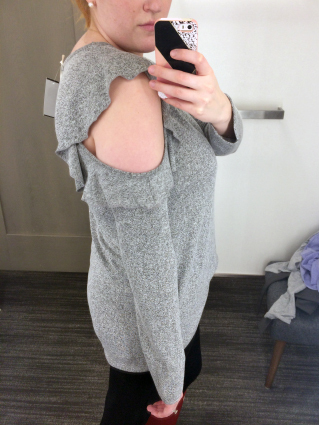 The sleeves grew on me though, and when I saw it was on sale I decided to head into the store to try it on. And, it turns out it's love! 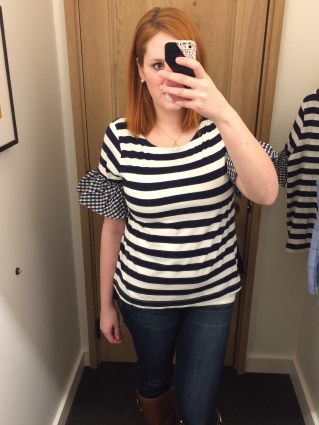 This is a fun change from my usual striped tees, and the gingham ruffles just have my heart. I initially grabbed an XL but it was way too big and looked sloppy, wearing a L here. This cold-shoulder top is comfortable and soft and oh-so-cute. I'm wearing an XL here and it felt way too big. They only had XL and XS in stores though so I left it behind. 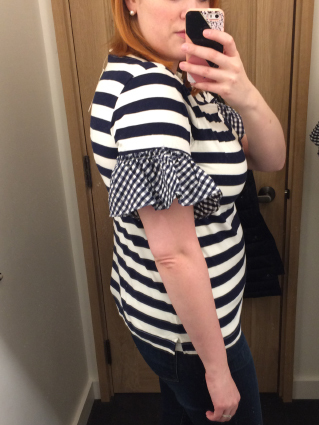 I couldn't find it online, but this bow sleeved top is calling my name! Sorry for the terrible picture here!! 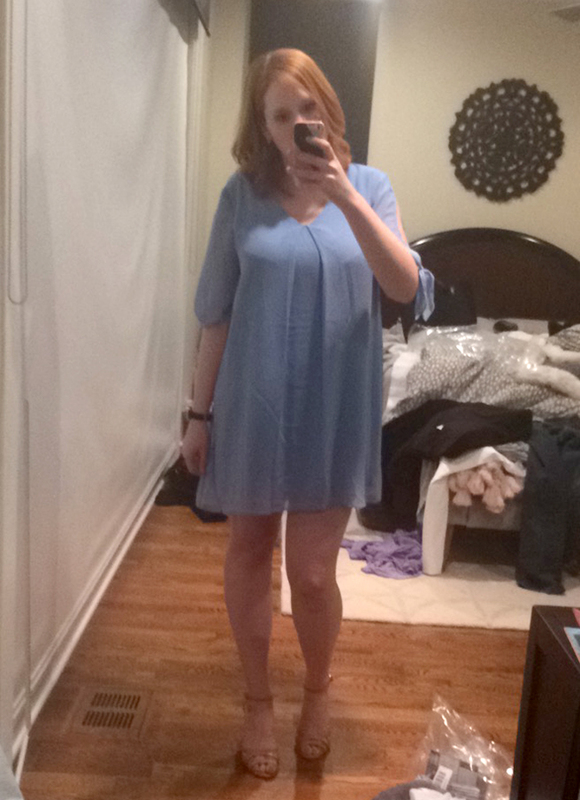 I've been looking for dresses to wear to weddings and showers this spring, and decided to give this floaty blue dress a try. I couldn't decide about it so I posted it on Instagram. While the results were mixed, too many people (including my husband) compared me to Wendy Darling, so it's going back. 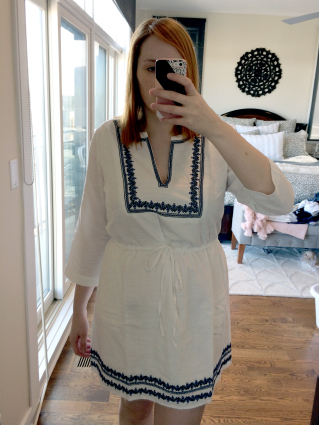 I think it would look super cute on less curvy girls though, and comes in a couple other colors that look less nightgown-ish. 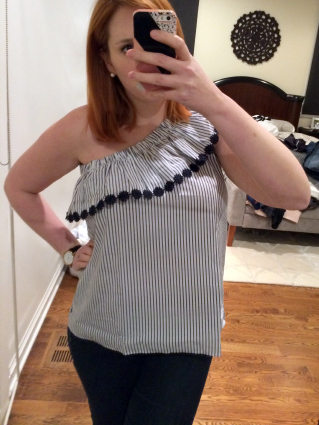 I've been looking for more warm-weather tops because there are surprisingly few in my closet, and this bow-backed top from Madewell fit the bill! I mean, it has bows. And ruffled sleeves. 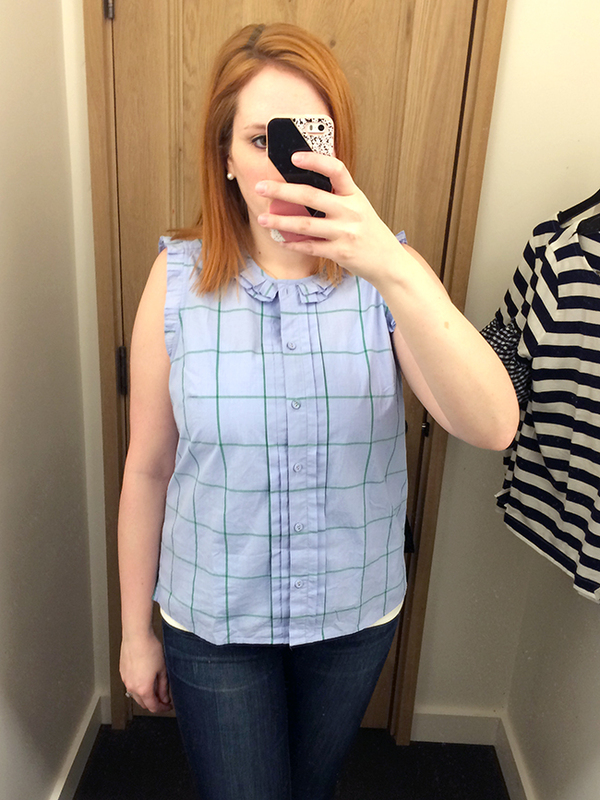 It's a teensy bit cropped but I think that will work well with shorts and skirts. Wearing a large here. 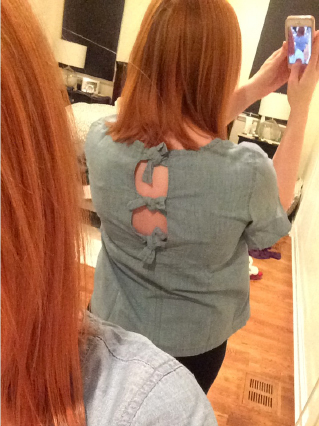 This one-shoulder top is probably my favorite purchase of the month! The one-shoulder is so cute, and I love the stripes and embroidery detail. 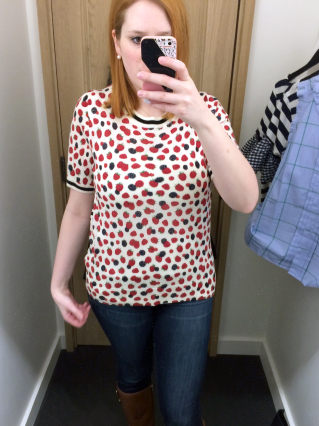 I tried this in a medium and in a large because I wear both sizes in LOFT tops, and ended up going with the medium. The large was too blousy in the bottom. 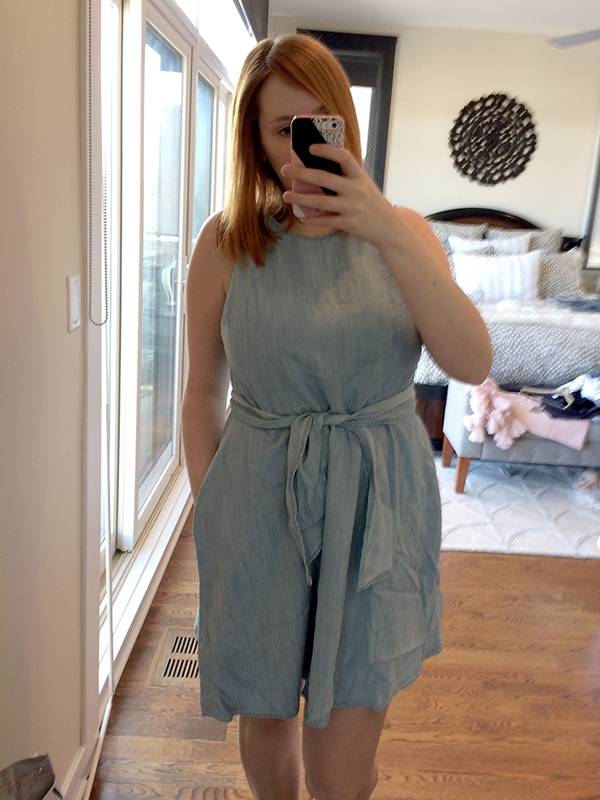 I wasn't entirely sure about this chambray dress when I ordered it online, but it's absolute love! It's made out of Tencel versus actual chambray. 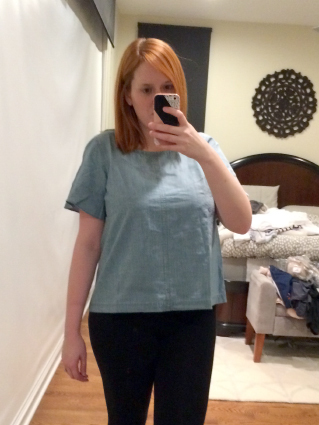 I've never heard of Tencel until recently but it's really soft and feels durable, whereas a lot of chambray is not that comfortable. I also love the tie waist - it's a riff on the faux sleeves around the waist and is so flattering. I love that the ties can be adjusted so they hit your waist at the most flattering point. Definitely a keeper! 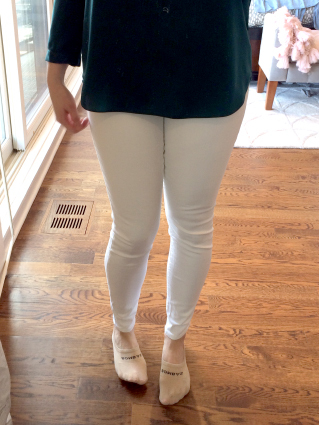 I've been wanting another pair of white jeans because my favorites are super distressed, which doesn't work for all occasions. This pair definitely fit the bill - comfortable, flattering, and not see-through! I'm wearing the talls here in my usual size, and the length is perfect. For reference, I usually wear a 35" inseam for full length pants. I wanted to love this embroidered dress. I really did. It's not see-thru (the most important thing to look for in a white dress), and the embroidery is oh-so-cute. But this was just way too big. I'm wearing a large here, and you can see that the front is too big at the waist - it's crinkling because I tried to pull the drawstring in. And the back has a huge amount of extra fabric. This is a problem I often have in dresses because of my chest, but usually things are still wearable. I would size down but I don't think that would solve the extra back fabric issue, so it went back.